This time of year always results in the oddest collision of feelings–excitement for the family filled fun that comes during the holiday season, either stress over the projects I need to finish for the holidays or disappointed-letting-go of projects I will never complete in time, introspection and reflection on what goals I met (and didn’t meet) in the year behind me, eager anticipation and renewed inspiration for the possibilities that exist in the new year, gratitude for the gifts that I experience daily, and many more in between. As 2017 leads into 2018, these feelings seem to crash together like waves, one emerging strongly at one point only to be engulfed and buried by another the next moment. That odd transition from one year to the next, it’s really just the passing of a day like any other, so how does it hold such power? Does this happen for you, too? or is it just me? 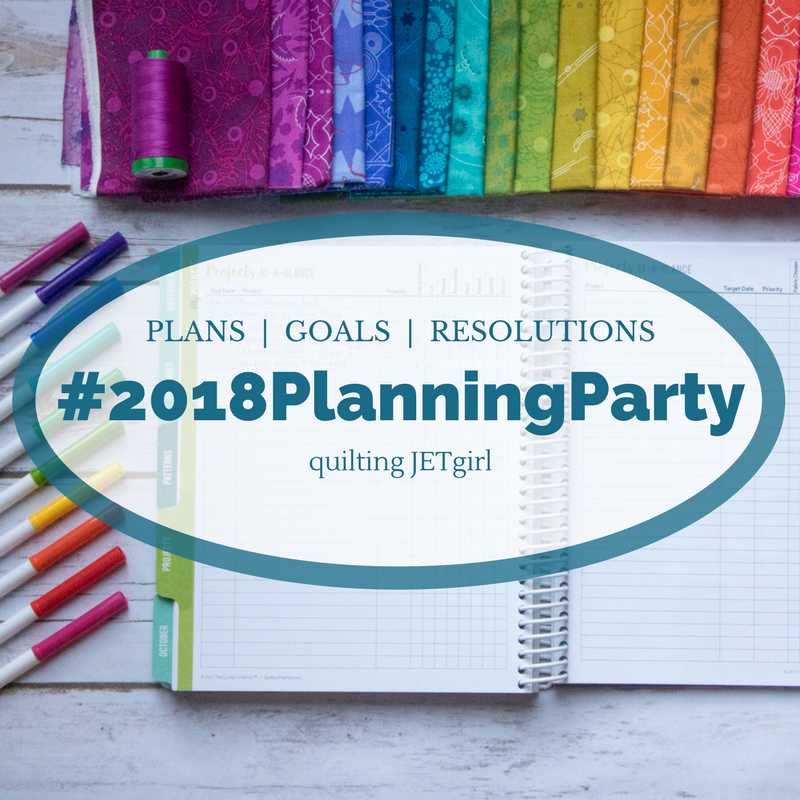 Every year, my dear friend Yvonne hosts a Planning Party on her blog Quilting Jetgirl, which really helps motivate me to sit down and sort through all of these feelings, reflections, dreams, and limitations, and try to determine my goals for the next year. I’ve decided to share my reflections on 2017 and goals for 2018 here, both to make a record of my intentions at this moment, and to maybe help inspire you to not only define your goals and determine steps to help you reach them, but also to be gentle with yourself when life doesn’t go as planned. Since honestly, when does life ever go as planned? Let’s start by looking at the goals I set for myself in January of this year. A few days ago when I read this over, I honestly laughed out loud. I’ll give you a spoiler: I accomplished hardly any of these goals, but oh, I had such high hopes back in January! Here’s the list, with my comments in bold after each one. brief description I did not meet this goal. Fear, or fear that I would not be able to dedicate the time needed to organize, piece, and follow through with this idea has stalled me. It’s still simmering, but has not been met. Overcome my fear of garment sewing by making at least three (3) items of clothing I attended the Slow Fashion Retreat with A Gathering of Stitches in August and I very much am slowly wading into the Slow Fashion movement. I’ve made two tops–one of which I might actually wear!, and I’ve found a sewing buddy with whom I aim to sew 9 garments in 2018, so I did pretty well with this one! Teach at least three (3) different quilting and quilt photography related classes–spread the love and inspiration for creating beautiful things! Not yet! I am teaching at QuiltCon in Pasadena in February 2018, so that will be one (well, 4 courses and 1 lecture!). Use my Quilter’s Planner to set manageable goals and help myself feel successful and motivated–including building up to exercising 5 times per week! Sad to say the exercise habit hasn’t happened. I have built up to doing yoga 3ish times per week, and I did a LOT of hiking over the summer, but I consider this goal not met. Stitch daily for 365 days as part of my participation in #1yearofstitches (more on this soon!) I very nearly succeeded in this! Near the end of the summer, I got off track, but so far have stitched for each day, even if it’s not posted on the correct day. I have a couple week’s worth of stitches to update on Instagram, but it looks like I’m actually going to meet this goal! Finish eight to ten (8-10) works in progress from last year!!! Oh goodness. No goal met here. I finished Finn’s Milestone quilt, but that might be the only WIP from 2016 that I finished. Oops. Yikes. Photo from about midway through the summer. There are many more blocks than these! So what did I do in 2017? I did a LOT of hiking! We hiked at least once per week pretty much every week from March through September. Paired with making an improv tree block before every hike, as well as other blocks to represent other summer adventures, my summer was pretty much filled with the Summer Adventure Quilt and all of the family adventures that went with it. I call that a win. I also did a lot of work for the Quilter’s Planner. Between photographing all 15 projects (I really need to share a post on this soon! ), taking photos of the 2017 and 2018 planner both for marketing and for posting on the Instagram feed, and working as the Social Media Manager heading off the Instagram feed, I spent a lot of my time helping inspire others and providing tips on how to plan, stay organized, and create a positive routine of productivity and inspiration. In 2018, I aim to practice what I preach! (laugh with me here!) Honestly, though, the Quilter’s Planner is such an amazing tool, jam packed full of inspiration. Working with Stephanie is really fulfilling and I really do love it. As with any job, it takes time. Finally, of course I’m also the full time mom of three amazing children, the wife of a fun-loving husband, and the keeper of a lovely home in rural Maine. That in and of itself is a full time job. All this to say, I’m not disappointed in what I accomplished in 2017. I do, however, hope to use this reflection to help me set more manageable goals for 2018. Where to begin? Since my high aspirations were a bit too high for 2017, I decided to focus on self care, family time, and finding a good balance of time spent on work and fun (both quilting and otherwise!). I pulled out my 2018 Quilter’s Planner and opened to the Yearly Goals page (this planner really is amazing… and that’s not just my bias talking) to help me brainstorm and get ideas down on paper. Sew 9 garments for me! Teach – rock my QuiltCon classes and lecture and then evaluate direction from there–do I actively pursue teaching gigs, or focus on home and family time until my kids are older? Take on no more than 4 outside sew-along, blog hop, or other pattern promoting projects unless it has a measurable impact to build my business. So there you have it. My goals for 2018 are laid out and in public. They now are real, even if they are still written in pencil in my planner. Any tips to sticking with your goals and making it happen? I’m going to begin by using my Quilter’s Planner in a more organized way. Right now, I absolutely can’t live without it, but I use it more of a to-do list brain dump and “if all stars align and everything is awesome” weekly and daily goals list, than a meticulous plan with actionable, measurable, and attainable steps to get me there. The brain-dump helps keep me sane, prevents me from missing appointments, and helps me feel like I accomplished something even on my craziest days. Now I think it’s time to step it up a notch and work on improving my routines to help me make better use of my time AND take better care of myself. Here’s to an inspired, productive, and nurturing year ahead! I’m linking up with Yvonne’s Planning Party 2018 over at Quilting Jetgirl. 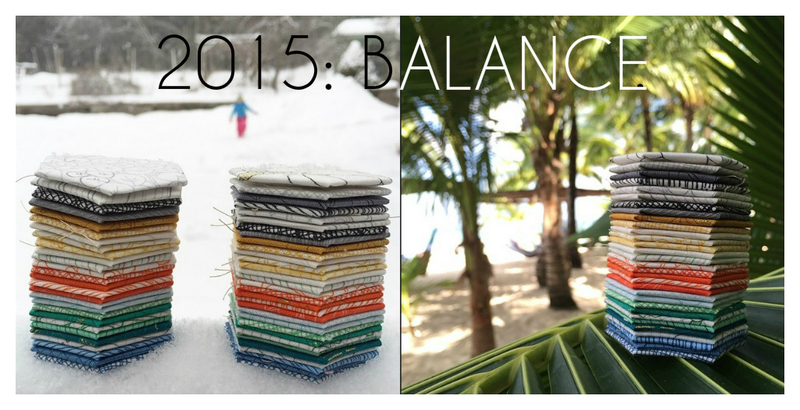 Last year, I chose “balance” as the word to guide my year. It’s hard for me to move my focus in another direction, since I know from the depths of my soul that balance is still very much at the top of my goals list, and most likely will always be there. In reflecting over the past year, I think I did a really great job of balancing quilting with family, friends, and the rest of life, at least up until the last couple of months. 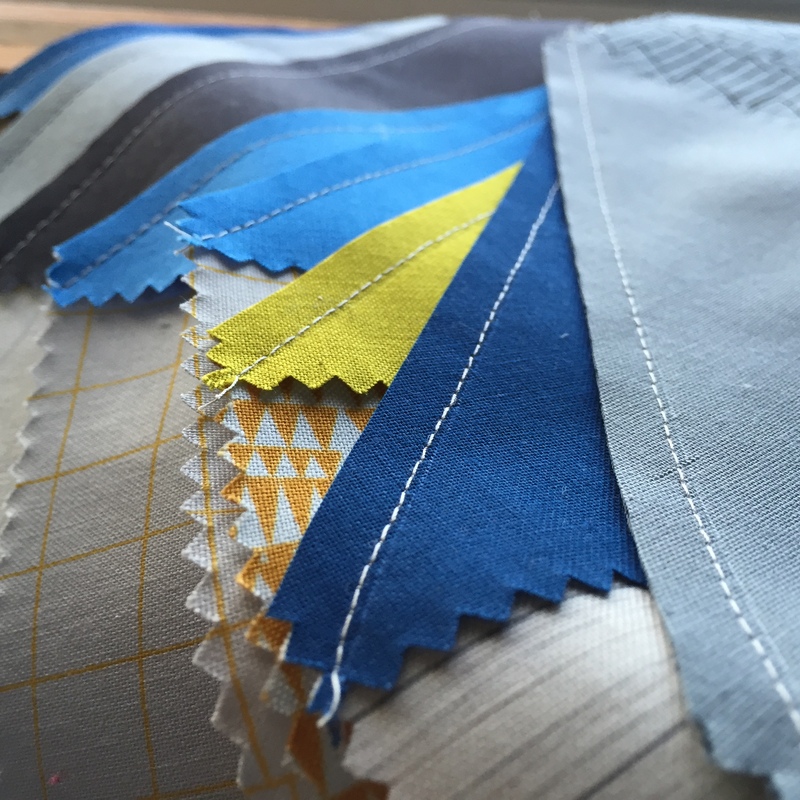 Toward the end of the year, I let my excitement at my success at making time to sew despite my full plate bubble over, and I bit off more than I could chew. I’m still floundering to get caught up so that I can feel that refreshed new year, new start feeling. I’ll get there. 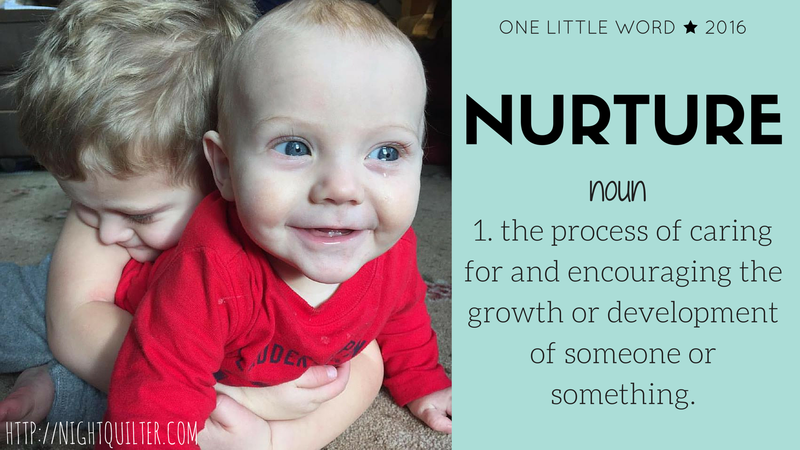 With all of that in mind, I’ve finally settled on a word to guide my 2016: nurture. My family as a whole–family fun time all together! Quilting community–I love this community and want to continue to share inspiration, ideas, and creativity with you. YOU nurture me! I suppose it’s a good thing that my biggest problem is wanting to say yes to everything, and wanting to create even half of the ideas that inspire me. But balance is key. This year, I hope to let NURTURE guide my creative, personal, family, and business decisions and continue to let my creativity shine. I’ve been letting my blogging slide a bit so far this year, but plan to get back into the rhythm of sharing inspiration here. As I mentioned above, I bit off more than I could chew at the end of last year, so I’m still working hard to catch up and meet some final deadlines. I miss you, and will share more soon! Thank you for following along with my creative process, and I look forward to many inspiring conversations in the year ahead! May this blog help nurture your creativity as well! This time of year often sparks reflection as we prepare to start afresh in the new year. It always amazes me to look back on a year in full, as I realize just how full and rich my life is and how much I’ve accomplished (and what I thought I’d surely have accomplished by now but haven’t). One of the fun aspects of social media is ability to use analytics to take a concrete look at the past year’s blog posts and social media interactions. Cheryl at Meadow Mist Designs is hosting a fun linky party inviting quilty bloggers to highlight their “best” posts of 2015. I’ve put together a few Night Quilter “bests” in this post, and I invite you to reminisce along with me. I could not possibly begin a “best of 2015” post with anything other than my most epic Friday Finish of all time: giving birth to my third baby, Finnian. While the blog post announcing his birth falls *just* outside the top five most viewed posts of the year, I’m including it first here. Family is always first. Plus… babies! Listing the most viewed blog post is a bit tricky, since typically posts that include a giveaway are viewed a lot more than those that don’t. Nearly all of my giveaways were accompanied by quilt or project finishes, though, so I’m including the tippy-top post here: the Doe Layers of Charm quilt I made early in the year. It has been viewed twice as many times as the next-most-viewed post, so it deserves a bit of spotlight. This was my first quilt made using all one fabric line, sewn for a Fat Quarter Shop short-cut pattern release, and what better fabric line to use than Doe by one of my favorite designers, Carolyn Friedlander. This fun and easy tip revolutionized my perle cotton storage and use, and clearly was an all around favorite. My dropcloth embroidery sampler color wheel is very high on my list of favorite projects, and I see that everyone else agrees. One of my goals for 2016 is to face my fear of sewing circles and finish this!! My Love Struck foundation paper piecing pattern ranks the highest in patterns sold this year (32%), closely followed by Lupine (18%). This may be old news for those of you who also follow me on Instagram, but there’s a rad analytic site called 2015bestnine.com (**Don’t visit this site right now. It appears to have been nefariously hacked since a “virus, ack!” pop up comes up on both my computer and phone when I go there now… but a few days ago it worked! **) where you type in your Instagram name and it generates a collage with your nine most viewed posts. 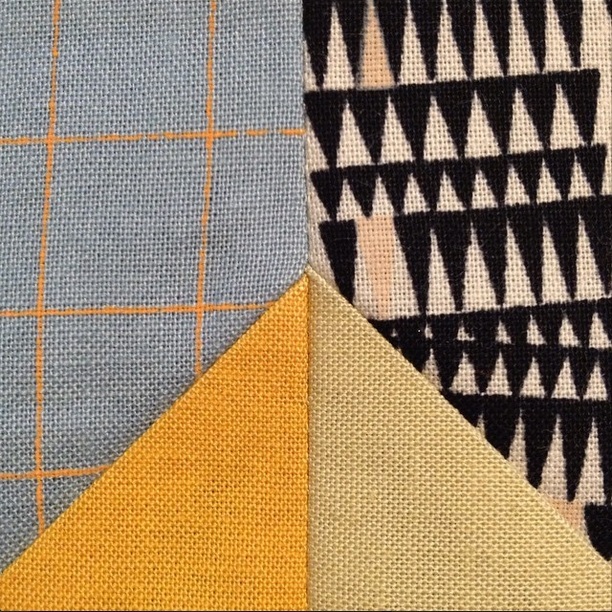 Here’s my collage, which includes all sorts of fun–Finn’s birth stole the show on IG, accompanied by my visible mending foray (have I blogged about that? ), modern hexies mini mini, growing tree mini quilt, the Rose Star EPP I made as my first big Sizzix tutorial, Finn’s milestone quilt project, and a Farmer’s Wife block. It really covers a large part of what I’ve been up to over the past 12 months, and of course includes rainbows. I’ve had a great year, and feel so grateful for all of your participation, support, love, suggestions, inspiration, and friendship. Without readers, without comments, without reaction, this blog is just an endpoint for my thoughts. Add you, and it becomes a foundation for inspiration, a jumping-point for new projects, and a connection between like-minded makers. I’m filled with gratitude. Thank you, too, to Cheryl, for giving me another reason to reflect and look back over the past year. It has truly been an amazing year, and I’m looking forward to a peaceful, productive, rainbow-filled 2016. 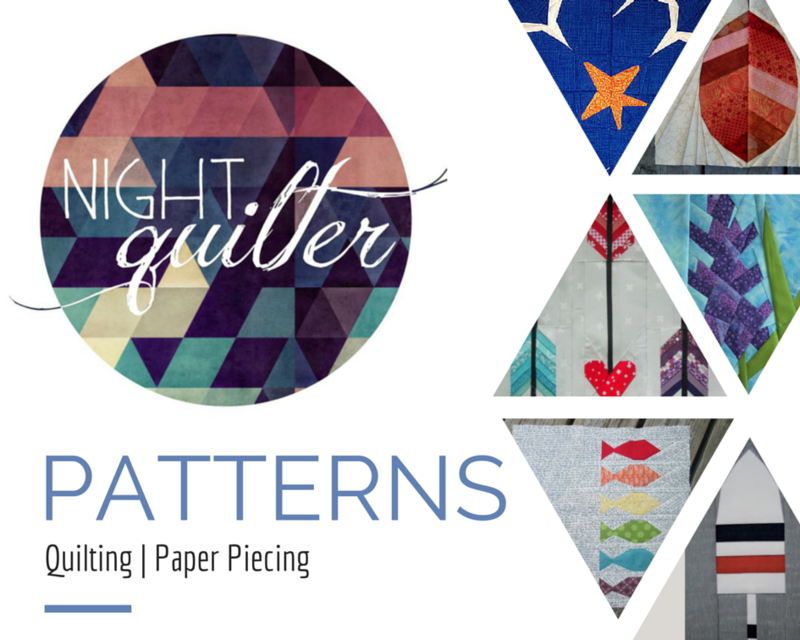 What was your favorite Night Quilter post or project from 2015? 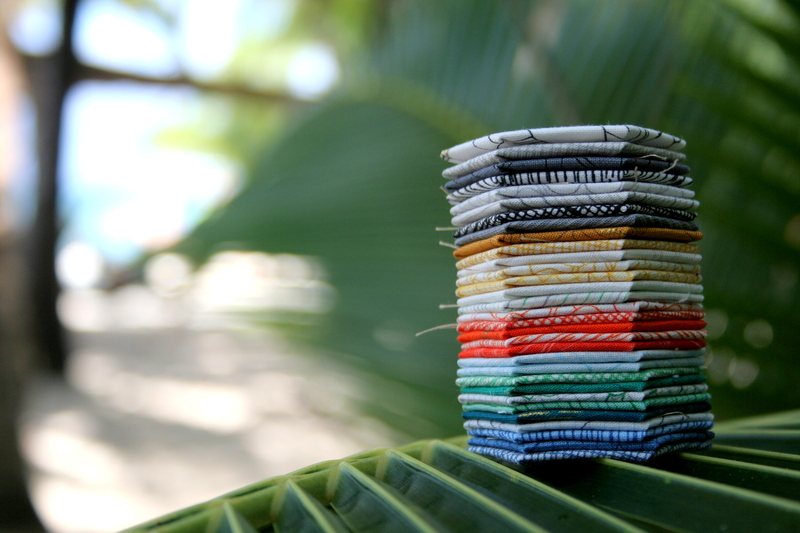 I did not do a stitch of sewing while actually on vacation, but I brought these hexies along for a tropical photo shoot in Cozumel. Talk about paradise!! To help me learn to focus on one main goal project at a time, I’ve decided to join in with A Lovely Year of Finishes. I missed the January goal-setting post deadline since I was away, but that doesn’t mean I can’t set a goal! I think my favorite part about ALYoF is that it forces you encourages you to choose just one project to finish each month. I am a perfect case of an ADD quilter–I often work on many projects simultaneously, not making any serious progress on any particular one. I’m hoping that joining ALYoF will help me stay focused and actually FINISH some serious projects. For January, my goal is to finish my secret sewing quilt. I know, I know… I can’t show you much since it’s a secret!! But I can show you the little peeks I’ve shared on Instagram, and can tell you that so far I have the quilt top finished. I need to piece the back (I have a grand plan of trying needle-turn applique for the first time ever to make the back as awesome as the front), baste, quilt, and finish the quilt. For a busy momma who gets maybe 5 hours tops per week to sew, this is a big goal. Why not start with a bang, right!? 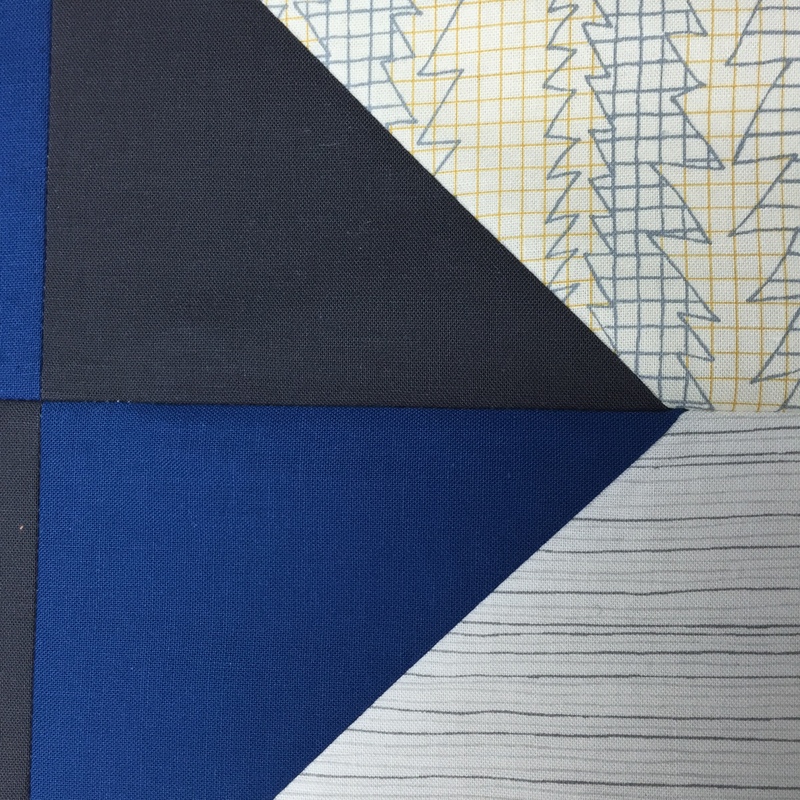 Since this is already one of the wordiest posts I’ve written, I’ll finish up with some peeks at my secret quilt progress. I get to play with Carolyn Friedlander’s new Doe fabric, which Robert Kaufman Fabrics was kind enough to send me a month in advance so that I could get the quilt finished in time despite the late December release date in the US. Doe goes SO well with its coordinating Kona solids. This project has helped me let go of a bit of my OCD. 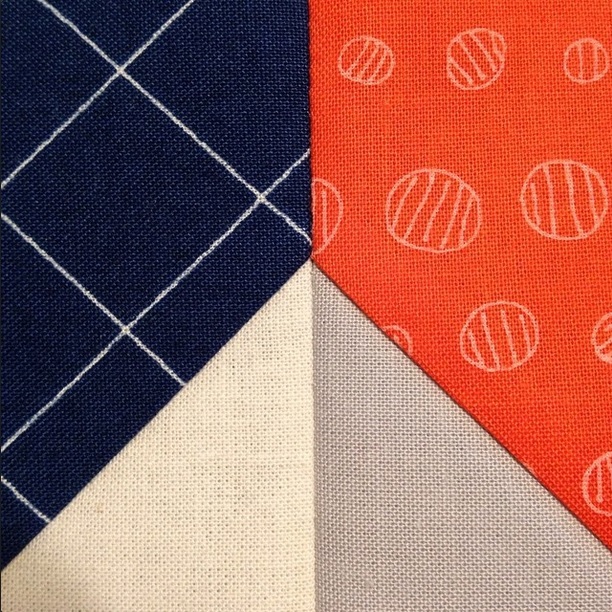 I let this imperfect seam match go, but the perfect center (far left) made up for it! I can’t wait to show you more, and I hope I can get it finished! !